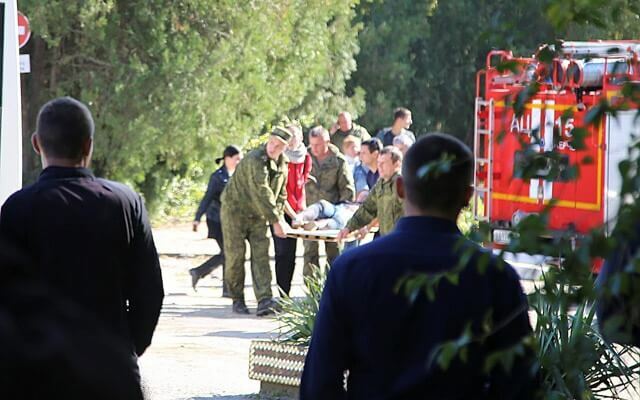 Moscow: A teenage student detonated an explosive device and opened fire at a technical college in Russian-annexed Crimea on Wednesday, killing at least 18 people and injuring 40 others before turning the gun on himself, Russia’s investigative committee said. Investigators said 18-year-old Vladislav Roslyakov, a fourth year student, launched an assault against fellow students at his college in the Crimean city of Kerch before killing himself, the BBC reported. “We quickly established the identity of the young man who arrived at the college immediately before the incident,” the investigative committee said in a statement. “Based on video footage, he was holding a gun in his hands,” it said, adding that his body was later found on the college premises with a gunshot wound. Officials initially said that an “unidentified explosive device” had detonated in the college’s dining area and called the incident a “terrorist act”. But Russia’s investigative committee later reclassified it as “mass murder”. An official said most of the victims were students of the technical college, which is a vocational school for 850 teenagers. The college’s director, who was not at the scene at the time of the attack, told the Russian media that unknown armed men had broken into the building. She compared it to the school siege of Beslan in 2004, during which about 330 people died. “There were lots of corpses, corpses of kids, a real terrorist attack,” she said. Kerch is located on the Crimean Peninsula’s closest point with mainland Russia, to which it is connected by a road bridge. Russia annexed Crimea — which has a majority ethnic Russian populace — in 2014 following the Ukrainian revolution; although Kiev maintains it is part of its territorial integrity.